There's a well circulated quip in the blogosphere that goes like this: "Members of Congress should wear their sponsors on their chest." Democratic U.S. Senate candidate Kendrick Meek is taking this idea to the next level by sponsoring Mike Wallace's car at the NASCAR Nationwide Series opener at Daytona International Speedway on February 13th. "I'm thrilled to sponsor the race car driven by Mike Wallace, a member of one of America's top racing families. The NASCAR Nation experience is a family affair, and my family will be together on pit road cheering Mike onto victory in Daytona," said Kendrick Meek. "NASCAR has deep roots in Florida, and the NASCAR family is hurting right now, as are Florida families. I'm running for the Senate to get Florida's economy working again for the NASCAR Nation and all families throughout this state." Meek is a fan of NASCAR and attended the 2009 NASCAR Sprint Cup Series at Homestead-Miami Speedway in his home state on November 22nd. At the time, Meek stated: "This is the second NASCAR race at Homestead that I have attended and this race plays a vital role in helping to improve our economy. Race day at the Homestead-Miami Speedway is always an exciting time, but the benefits of this race for the people of this region are felt for months afterwards." In the Florida state legislature and now in Congress, Meek sponsored legislation supporting the racing industry, including the recently passed tax extender package that includes the 7-year accelerated depreciation schedule for motorsports entertainment complexes that cleared the House of Representatives in late 2009. The legislation will have a positive direct economic impact in the Daytona Beach area and throughout racing communities in Florida. Meeks and his family plan to be on pit road with Wallace this weekend at Daytona. 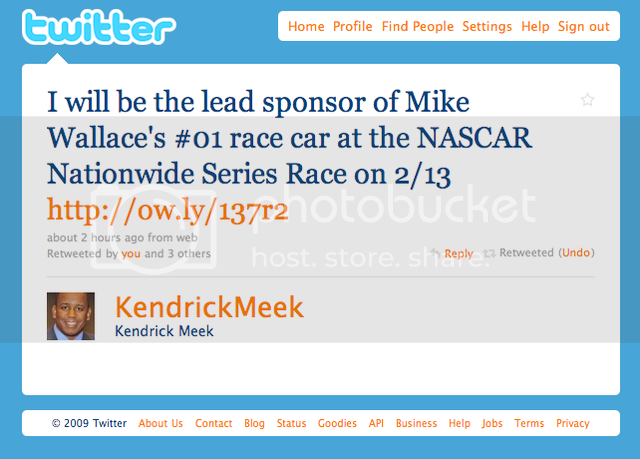 As for the candidate's sponsor activation, supporters of Kendrick Meek are invited to log onto www.kendrickmeek.com to participate in an online contest, with the winner receiving a pit pass to join Kendrick, his wife and two children, as well as Mike Wallace, and his J-D Motorsports #01 Chevrolet team on pit road during race day.